Nearly 790,000 young unauthorized immigrants have received work permits and deportation relief through the federal government’s Deferred Action for Childhood Arrivals program since it was created five years ago by President Barack Obama, according to the latest data released by U.S. Citizenship and Immigration Services. The program, known as DACA, was created through an executive action Obama signed in August 2012. It gives unauthorized immigrants who came to the U.S. before age 16 – a group sometimes called “Dreamers” – a chance to stay in the U.S. to study or work, provided they meet certain conditions such as being enrolled in high school or having a high school degree or GED equivalent, and not having a serious criminal conviction. Those approved for the program are given a work permit and protection from deportation for two years, and these benefits can be renewed. In total, about 1.1 million unauthorized immigrants are eligible for the benefits, according to a 2014 Pew Research Center estimate, which means that about 78% of those potentially eligible have applied to the program. The total reflects the number of applications during the life of the program, not the number of applications approved or immigrants currently receiving benefits. President Donald Trump is weighing whether to continue the program or end it. In the past, Trump has said he may create a way for those who have benefited from DACA to stay in the U.S., but he also made a campaign promise to undo all executive actions taken by Obama. Separately, Congress is weighing legislation to give “Dreamers” a chance to legally stay in the U.S. A bill backed by a group of Democratic and Republican senators would offer protection from deportation and a work permit for three years to those eligible for DACA benefits. Several U.S. senators who support the bill represent states with some of the highest number of DACA recipients, including California, Illinois and Arizona. 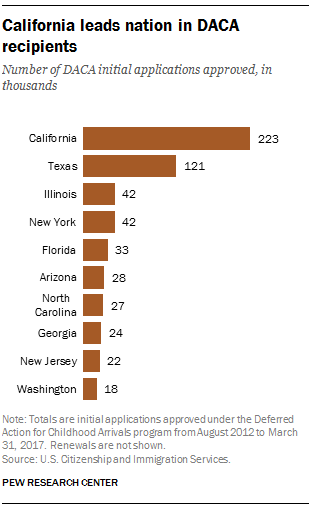 California alone has 222,795 initial DACA recipients, the highest in the nation, followed by Texas (124,300) and Illinois (42,376). 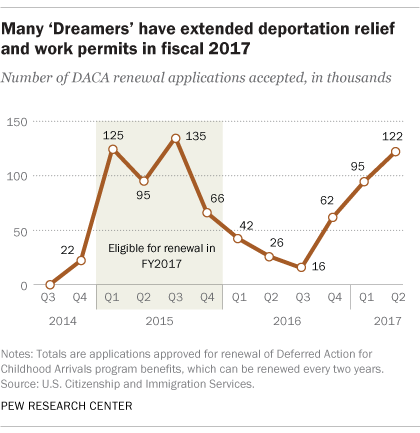 Unauthorized immigrants from Mexico make up more than three-quarters of all DACA recipients. Since the program started, 78% of approved applications – both initial (618,342) and renewals (622,170) – have come from Mexicans. Note: This is an update of a previous post, originally published Jan. 5, 2017.